If you’re currently residing in the Chandler, AZ area and want to add a pool to your property, No Limit Pools is here to help. Few things are more relaxing than taking a dip in the pool on a warm day, especially in an area like Chandler, where the summers are particularly hot. We provide customized designs for your pool that are specific to your needs and décor preferences. Before you start the process, here are a few important things to keep in mind. When it comes to your pool design, write or sketch your idea down and give it to the pool builder of your choice so they have a better idea of what you would like the final project to look like. You may find that you need to make a few adjustments before you share your plans with the contractor. Finding the right pool builder is essential. They can tweak your design to make it even better. You will be provided a complete layout design which will enable you to view what your pool will look like when the project is complete. The yard is the site of your new pool. This means you’ll have to think about the shape and size of the yard when you’re designing the pool. Think about the other landscaping on your property, so you’ll know how much space you have to build the pool. Consider large trees and plants in your yard as well. If they are too close to the pool, the leaves could shed and end up in the pool water, which can lead to algae growth and bacteria. Choosing the right pool builder can help you. The best swimming pools are a combination of great style and effective function. This means you should think about how often and in what ways you want to use the pool. If you’ll be using the pool for exercise or swimming laps, a rectangular shape is best. A pool with a shallow end or a Baja ledge is best if kids will be in the pool often. The shape of the pool will also determine the maintenance routine you’ll have to follow. A simple design shape works well if you’d prefer a pool that doesn’t require lots of costly or intricate repairs. Anticipate your pool needs over time when you’re considering the pool design. It’s best to choose a pool design that is easily accessible if you have children in the home. This is also a great idea if you plan on being in your home permanently, since it can be more difficult to get into the pool as you get older. An extremely deep pool can be a safety hazard for children and pets, so a shallow model is usually best. Think about how difficult it would be to keep the pool looking and functioning at its best, in case you want to sell your home later. The pool can be used as a selling point and increase your property value. Contact No Limit Pools for more information on pool designs perfect for your budget and sense of style. Our team understands that every pool construction project is different. That’s why we’re committed to offering you a customized service that will give you the results you want. 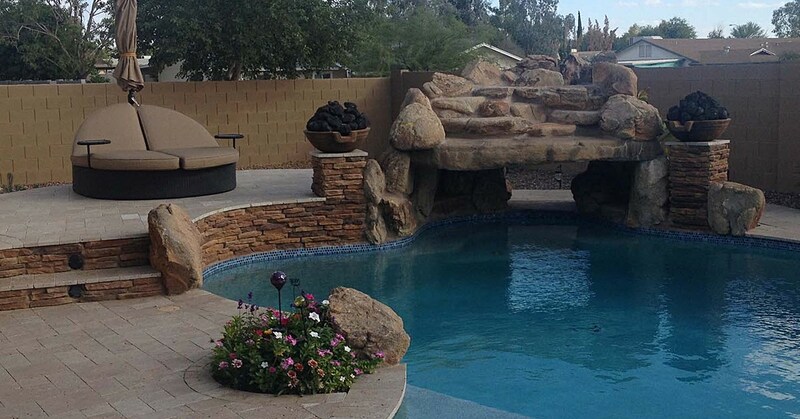 We build unmatched custom pools in Phoenix and the surrounding areas of Chandler, Gilbert, Mesa, and Grand Canyon AZ. 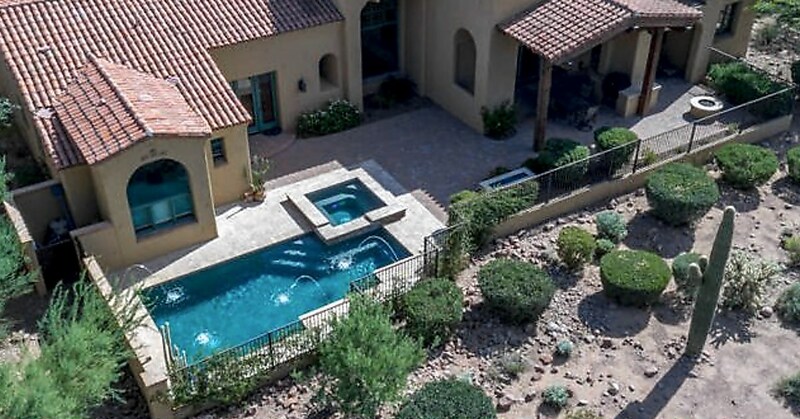 We are rated one of the best “pool builders AZ” and “pool companies in Phoenix” and have become a Chandler Pool Builder that homeowners are hiring. On our website, you will find favorable reviews from our satisfied customers, as well as our contact information and ways to get in touch with us. We look forward to hearing from you. If you and your family have made the exciting decision to get a pool, it’s time to begin the planning process. Deciding on the layout for your pool is a fun but challenging process. The right layout depends on how often you’ll use the pool and how much space you have. You will also need to consider your property’s layout and the other decorative features in your backyard. You may also want some cool pool features that are truly one of a kind. Here are a few practical tips for finding the swimming pool layout plan that’s right for you. The size and shape of your pool can make a huge difference in the way your yard looks. A rectangular pool is traditional, but there are several original accents you can add. Instead of the standard rectangular shape, you can make the entrance to the pool look more like a beach or ocean. Infinity openings make the pool entrance look like a natural shore. You can achieve this look with concrete or fiberglass. Your contractor will also work with you to help you decide the main purpose of the pool. A larger pool in a rectangle or square could work well if you have a specious yard and entertain often. A rectangular pool with rounded edges is a creative take on a standard pool. This design also gives the pool an elegant resort feel. If you’re using the pool for athletic purposes, it’s a good idea to have as much pool space as possible. If you don’t have small children and want to use the pool mainly for relaxation, circular or triangular pools are a stylish idea. You can even ask about spa or hot tub designs. These smaller pool options can be used for therapeutic purposes. They can be used to soothe the muscles and even prepare the body for a more restful night’s sleep. Once you decide the shape and size of your pool, you’ll need to determine the overall layout. If the pool will be the feature attraction in your yard, it should be in the center of the yard. This will ensure that it’s not too close to your home, but is also a comfortable distance from your back door. You can also work with your contractor to have your pool deck connected to your patio. This allows guests to seamlessly go from the pool to the seating area. There are several stone, mosaic, fiberglass, brick and concrete materials to choose from for this process. The right deck and pool border materials can make your outdoor entertaining space just as appealing as your home’s interior. If you want shrubs or trees around the pool, your contractor will give you information about how to position these plants. Other design elements can include fountains and places to install permanent seating around the pool. Working with a professional team will make it easier to choose the design elements that are both practical and stylish. Contact No Limit Pools when you’re ready to have your backyard pool designed and installed. Even if you’re not sure about the size and shape you want, if you’re in the market for a pool, we can help. As the top AZ pool builder in the Phoenix area, our team has the skills and expertise to create the perfect pool for you. We’ll make recommendations based on your design style, budget, and size/shape of your backyard. We serve residential areas in Gilbert, Mesa, Chandler, and Gold Canyon Arizona, and you can visit our website any time to schedule a consultation. If you’ve just moved to a new home or you’re thinking about getting a pool for your current home, you may have some concerns. Deciding whether a pool is worth it depends on several factors. Working with qualified contractors will help you make your choice. Not only will you be able to decide whether you want a pool, you’ll also get information on how to properly maintain your new pool. Here are a few points to consider. Should I Get a Pool? If you and your family and friends are avid swimmers, a backyard pool could be a good idea. If you know that you’ll be in your home for at least five more years, a pool may be a great choice. Having a pool installed is also ideal if you’re going to be selling your home in the near future and want to make your property more valuable. A pool provides another form of entertainment for your loved ones to enjoy. Pools also encourage you and your relatives to exercise more, since there are several workouts you can do in the pool. If you get a smaller pool with jets, this is a great way to soothe muscles after intense workouts or to manage conditions like fibromyalgia and arthritis. Are Swimming Pools a Good Investment? It’s important to remember that while a pool can be a worthwhile investment, it can be costly to maintain. Pools need to be cleaned regularly. The concrete or fiberglass around the pool needs to be kept clean as well. The water will sometimes need to be treated, especially after drastic changes in the weather. It’s more affordable to maintain the pool regularly. You’ll need to call contractors for some pool maintenance services. However, maintaining the pH of the water and keeping the pool area clean will keep maintenance costs down. Do Swimming Pools Add Value to Your Home? A swimming pool return on investment is very possible when you add a pool to your property. If you’re putting your home on the market, you can increase the asking price because of the pool. You may be able to ask for even more if you’ve kept the pool in great condition. If there’s an outdoor kitchen or lounging space near the pool, this increases your property value as well. Swimming pools can also add value to your home by providing another source of recreation. While this doesn’t indicate direct monetary value, your home will be more appealing to your family. The pool and outdoor space may also be one of the factors that will make you want to stay in your home. What Type of Pool Is Best? The type of pool that is best for you depends on a few factors. If you have a small yard, a circular pool or spa-type pool may work best. Larger pools are ideal if you entertain often or have a big family. Pools with additional features like fountains and rock structures work well depending on your sense of style as well. If you’re not sure which style or materials to choose, a professional pool construction team can help you narrow down your choices. Contact No Limit Pools to find the pool that is perfect for you. We’ll work with you to find the pool that fits your yard’s shape and size. 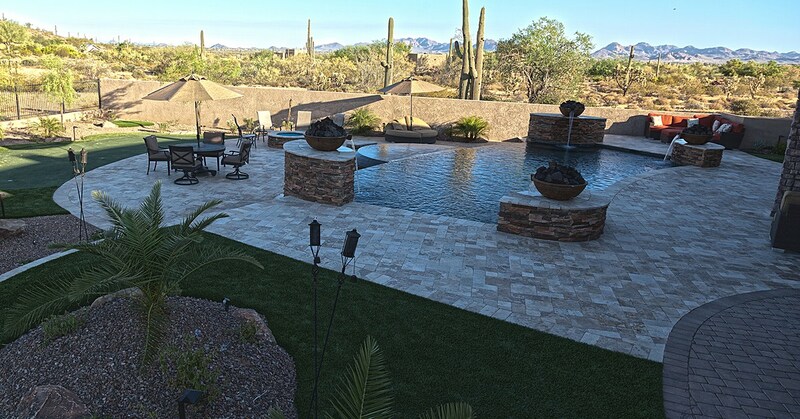 As an Arizona pool builder in the Phoenix area, we have the right materials to help you achieve the pool of your dreams. Our experienced professionals also know which methods will work best for your landscape and the outdoor space you want. We serve clients in Mesa, Chandler, Gold Canyon, Gilbert AZ and the surrounding areas. We are happy to meet all your pool-related needs. If you’ve had a pool for a while, you know how important regular maintenance is. You may also want to update the look of your pool to match the remodeling you’ve done to your home or outdoor space. Renovating your pool can be a matter of safety as well. Pool renovation can be just as big of a job as installation. This means you’ll need to work with an experienced and skilled team to get the job done right. There are a number of reasons you may want to remodel your pool. if your pool is a few years old, you may need to inspect to pool to see if there are cracks or leaks. These need to be repaired right away before the repairs get too costly. Your pool equipment also needs to be updated every few years. If you find that you need new large or integral pool appliances, this is a good time to remodel the pool. Pool remodeling ideas can also include changing the shape of the pool. This can be a drastic remodel or a major renovation. For instance, if you’ve recently added an outdoor kitchen to your backyard, you may want to make the pool slightly smaller to make room for more seating or walkways. Adding stylish pool borders and features like waterfalls and rock structures are also worthwhile renovations. These add visual appeal to the pool and make the space look more like a vacation result than a backyard pool. You may also want to add safety amenities to the pool. Extra railing for the sides of the pool, slip-resistant materials around the pool and safer ladders or diving boards are great remodeling choices. These features are ideal if you have small children or elderly family members who want to enjoy the pool. Remodeling in inground pool isn’t a task you should take on yourself. While it is possible to get the look and features you want if you work hard at it, it’s much easier to call the professionals. Pool contractors know how to properly measure your pool and assess any pool damage. Pool building professionals can also let you know how much room you have to elongate the pool without interfering with your seating or lawn space. Even if your pool is inground, there are some above-ground renovations you may want to consider. You can make changes to the border of the pool and the walking space leading up to the pool. 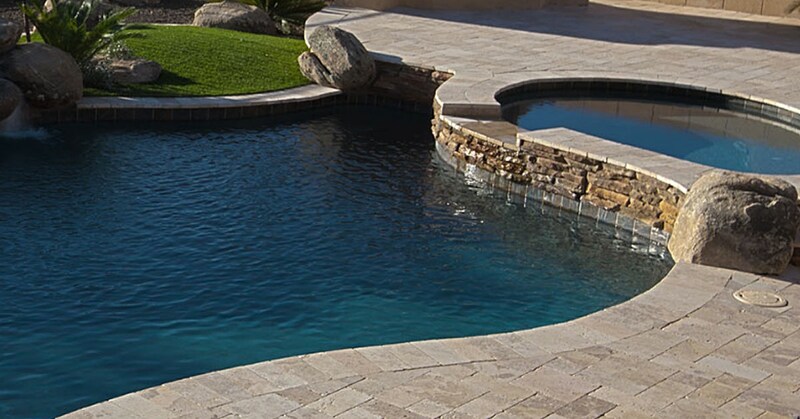 Cobblestone designs add texture and warmth to the pool space. Concrete options are available in several colors and are ideal if you want the pool to have a modern look. You may also want to add a deck around the pool. This provides additional room for your friends and family to sit or stand in between swims. The borders and decks can also be made from materials that coordinate with your home. This makes your entire properly look uniform, and can even increase property values if you decide to sell your home later. Contact No Limit Pools, the best Arizona pool builder in the Phoenix area, when you’re ready to renovate your pool. We serve customers living in Mesa, Chandler, Gold Canyon and Gilbert Arizona and the surrounding areas. We will be happy to answer any questions you may have. If you are looking for a pool renovation company outside the areas we service just search for ‘pool renovation companies near me’ to get information about different companies. At No Limit Pools our qualified staff can also suggest the best renovations for your pool based on the size of your yard and your design goals. Visit our website today to schedule a consultation. Now that you’ve picked out the layout and design for your beautiful new pool, it’s time to explore coping options. Coping is the process of selecting the stone or concrete that is used to cover the pool’s shell wall. Coping helps to protect the pool and the surrounding property and gives more definition to the pool shape. There are a few pool tile and coping ideas to choose from, and No Limit Pools is here to help you with the process. This is one of most common options. While there are a variety of pool coping stones, poured concrete connecting the coping with the pool deck. The concrete goes just over the pool’s edge. This eliminates any breaks in the overall finish. Poured concrete can make a small area surrounding a pool look significantly bigger. This method also gives the deck cleaner lines. This is ideal if you have a minimalist sense of style and want to make sure the pool architecture speaks for itself. Coping made from natural brick or stone gives the pool area warmth and texture. The stone is sturdy and adds a great contrast between the water in the pool and the grass in your lawn. There are several materials that can be used to achieve a natural stone look, including limestone, quarried granite and natural fieldstone. The materials are long-lasting and can withstand water and heavy foot traffic. If you decide to use natural stone, it’s important to specify that you want consistent coping thickness, since this part of the pool will be immediately noticeable. If you choose precast concrete, there are several colors, textures and patterns available. Precast concrete also comes at a lower cost than natural stone or poured concrete. This makes it a great choice if you’re looking for a budget-friendly option that is still visually appealing. Precast concrete is also easier to install. The concrete makes the area around the pool look especially uniform and provides more consistent thickness and color than natural stone. Bullnose coping is a great addition to your pool construction project. It’s used commonly as the smooth, finished edge around the pool. Bullnose coping can be used to highlight the entryway or steps in your outdoor living space. Stone is often used for bullnose coping, but bullnose brick pool coping is an attractive option as well. It’s best to get this type of coping done while the pool is being constructed for the first time. However, you can also work with your contractor to get bullnose brick or stone coping if your pool is being remodeled. The most popular type of coping is top mount coping. This is also known as C-channel coping or half-round coping because of the profile shape. It’s made from aluminum that is coated with powder. Cantilever edge pool coping is another method that works for pools of various shapes as well. For this method, Styrofoam forms are attached to the pool lip temporarily. A concrete deck is poured, then the foam forms are removed. If you’re in Phoenix or the surrounding cities and need pool coping services, contact No Limit Pools. 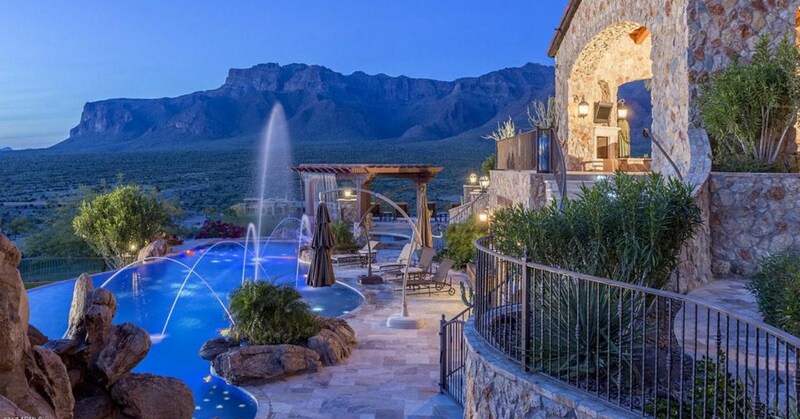 No Limit Pool is the premier AZ pool builder in the Phoenix area and also services clients in Chandler, Gold Canyon, Gilbert, and Mesa Arizona. If you contact us and find we do not service your area simply search ‘pool coping near me’ to find a company in your area. At No Limit Pools, we have materials and pool options for a variety of budgets and yard sizes. Our qualified team can help you come up with pool tile ideas that will make your pool look especially decorative and inviting. Do you have a pool? Are you thinking about purchasing one? Are you wondering how to customize your pool space? No Limit Pools is an expert in custom pool building. “One of a kind” custom pools is what we are known for. We design based on needs, property shape, home architecture, safety and more. No Limit Pools will provide all the resources you need to be completely happy with the finished product. When it comes to luxury pool designs, there are lots of features and construction ideas to choose from. You can add original designs and materials to your pool area that will make space stand out. No Limit Pools is here to help you make the choices that will work best for your yard and pool needs. If you entertain outdoors often, having a kitchen constructed in your yard could be a great idea. An outdoor kitchen can increase your property value. It will give you more time to spend with friends instead of running back and forth to the indoor kitchen. The kitchen is also an appealing feature when you have a pool or hot tub in your backyard. You can easily provide food and beverages for your guests in between enjoying time in the water. The pool and kitchen areas can be coordinated to exhibit the same color schemes and materials. If you’re interested in looking at poolside outdoor kitchens, our professional design team at No Limit Pools can help. Coming up with backyard ideas with pool and outdoor kitchen is often a matter of practicality. The No Limit Pools team can help you choose the features that will be best for your kitchen space. You’ll get to select the stove and oven size that matches your cooking needs; there are electric and gas options available. Refrigerators are also an integral part of outdoor kitchens. The space in your yard may not allow a refrigerator that is the same size as the one indoors. However, there are several models you can select from that will hold a considerable amount of food and beverages. Counter space in the kitchen is also important. Especially if you want to do all or most of your food prep outdoors while you’re socializing with family and friends. The counters can be both attractive and functional. For design inspiration, you can take a look at the colors that decorate the borders of your pool. The colors of the seating and the waterfall or fountain can also inspire the color and style of the counters. If you spend lots of time outdoors you may want to add a grill to the outdoor kitchen space. Whether you want a large, elaborate grill or a small grill, No Limit Pools is here to help. When you’re building a kitchen, there are electrical and plumbing issues that have to be taken care of. No Limit Pools can inform you of the necessities and explain the installation process. This will help you determine which outdoor kitchen features are best for your yard and your budget. Most of your outdoor kitchen will look the way you want in terms of material and color. However, there are additional aesthetics you can add to make the space unique. If you’re having a bar constructed around the kitchen, marble or granite makes the area especially elegant. Tables and chairs can be built into the ground to make the backyard look like an expensive resort. Adding fountains, waterfalls, and benches also make the space more inviting and can improve the overall look of your yard. No Limit Pools has everything you need to achieve the outdoor kitchen of your dreams. We have a wide variety of outdoor kitchen and pool ideas to choose from. You can find the kitchen design you want. You will also get beautiful and modern suggestions for constructing or remodeling your pool. Contact No Limit Pools for all your pool construction needs. 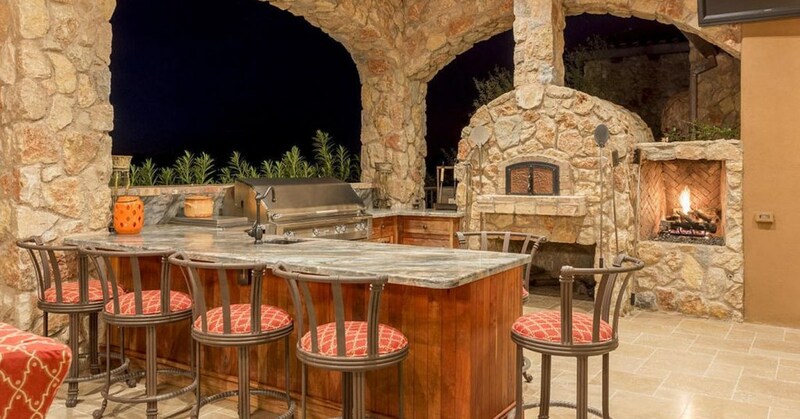 We are known for building outdoor kitchens that impress in the Phoenix AZ area including Chandler, Mesa, Gilbert, and Grand Canyon. Posted in New Pool Construction, Outdoor Kitchens, Pool Builder, Uncategorized | Comments Off on Outdoor Kitchens That Impress! Deciding to have a pool built in your yard is a major decision, both aesthetically and financially. It takes careful planning, a budget, and familiarity with your property to ensure the process goes smoothly. Once the project is complete, you want to be completely happy with the finished product. That’s why No Limit Pools is committed to assisting you through each step of this process. Here are some important things to look for in a pool builder. Building a pool requires more than simply digging a hole in your yard and placing a pool structure inside. At No Limit Pools, we understand that your yard and property have to be carefully evaluated. This allows our builders to come up with a specific plan for the shape and size of your yard. Knowing more about the building options that are available for your property will also help you narrow down your choices for a pool that is both safe and attractive. A property evaluation will also let you know how deep builders have to dig to create your pool. You’ll learn about construction based on your grass or soil and how close you want the pool to your home. No Limit Pools is a family-owned business. So, we understand how much of a priority it is to spend time with the ones you love. We help to make the pool area an outdoor living space, so you can entertain friends and family. We listen to your requests regarding adding more space for seating or adding custom décor to your pool. Features like an outdoor fireplace or a pavilion can be added to the pool to make the area more inviting. We can also connect a hot tub or wading/kiddie pool the main pool, or close to the pool. We want to make sure that all your loved ones are safe and comfortable in this outdoor space. Building a pool is a major home project. We know budget planning will likely be part of the process for you. Our prices are competitive, and we strive to offer you the best services and products. We have finance options that allow you to get the pool of your dreams at the price that works for you. If you already have a pool in your yard but want to make changes, we have several pool remodeling options. The cost of pool installation or remodeling varies depending on materials and labor. However, that shouldn’t stop you from having a safe and beautiful pool you can enjoy for years to come. 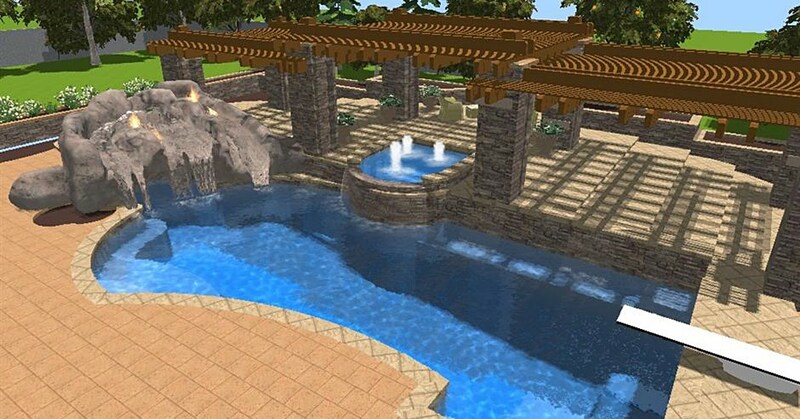 No Limit Pools has built a reputation as being one of the Best Phoenix Pool Builders. We welcome you to read our long list of reviews. Feel free to contact No Limit Pools for additional information on the pool building process. We’ll provide the specifications for your property and desired pool style. We will work to ensure that you’re completely satisfied with the results. 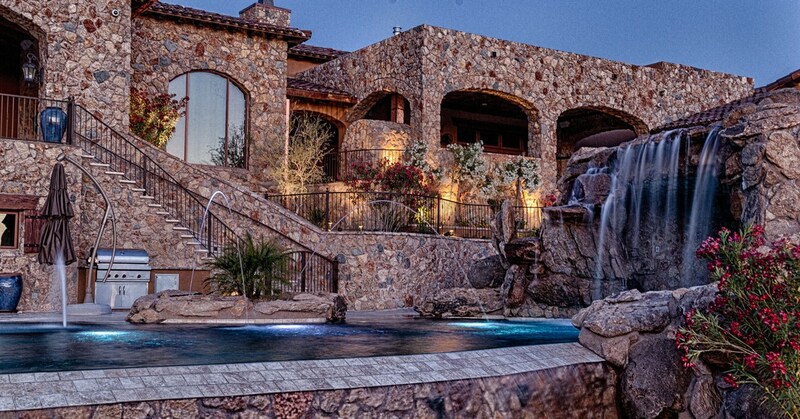 We design and build beautiful pools in the Phoenix, AZ area as well as Chandler, Mesa, and Grand Canyon. Whether you already have a pool on your property or are thinking of getting one, you should have hardscaping designs in mind. There are a number of hardscape ideas to choose from. These design solutions are based on the shape of your pool, as well as your personal taste and size of your pool and yard. Phoenix Pool Contractor You Do Not Want To Miss!